It’s easy to see why so many slide presentations feature images of interlocking gears to evoke efficient human activity. Gears convey a seductive sense of control; they appear reassuringly neat and predictable. These mechanical parts are perfect for representing machine age detachment; the opposite of design thinking. But gear metaphors also communicate an anti-innovation world view. Knowledge (in contrast to information) gains value when humans develop what they know through reflection and interaction. The reality of this process is far from neat, predictable and mechanical. Developing the wealth of knowledge that leads to innovation requires relationships built on trust. Gears do not evoke trust or thoughtful reflection. So let’s not misrepresent living, human activities such as collaboration with graphics that glorify interchangeable metal parts. Ross Dawson coined the term “black-box consulting” to describe low value consultant-client transactions in his book, Developing Knowledge-Based Client Relationships. When I first read Dawson’s contrast between transaction vs. co-creation consulting models over a decade ago, his views struck me as the way of the future for anyone in the business of offering advice—including doctors, designers, real estate agents, lawyers and tech consultants. Today I am even more convinced of how important it is for clients and consultants to think through opportunities and options together. Black-box consulting happens when neither client nor consultant emerges from the assignment any wiser. Essentially, the client receives an outcome without meaningful participation in the process. Dawson says that this opaque model turns the service into a commodity because there is no shared knowledge-creating experience which leads to better decisions. Moreover, the black-box yields no learning, no ah-ha moments, no growth and no transformation. Which also means that black-box engagements prevent any chance to think through fresh possibilities together. Black-box relationships are about minimal interaction, avoidance of risk and low personal commitment–the opposite of what’s required for innovation. The service becomes a commodity when there is no shared knowledge-creating experience that leads to better decisions. Black-box consulting yields no learning, no ah-ha moments, no growth and no transformation. So clients and consultants do themselves a disservice when they rely on third-party selection processes and impersonal working relationships, which limit their ability to create value together. We need thinking partners to wrestle through complex challenges. Dawson’s book presents a framework for clearly seeing why transactional advice-dispensing models lead to competition driven by price rather than value, as well as doing things the same old way. These two university athletic facilities demonstrate vastly difference attitudes toward connecting with the street and campus. 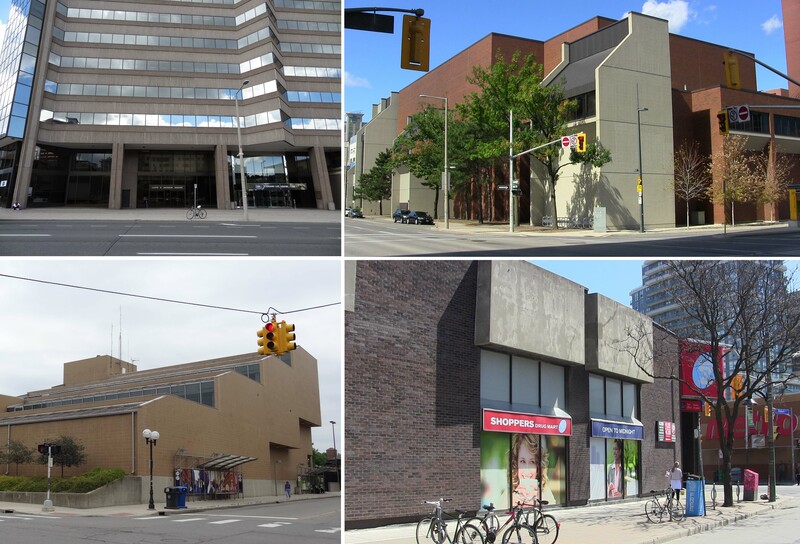 The University of Toronto Athletic Centre (left) is an unwelcoming fortress with no indication that healthy activities might take place within. By contrast, the recently opened Goldring Centre for High Performance Sport, designed by Patkau Architects and MacLennan Jaunkalns Miller Architects (right), is visually connected with the street and conveys a message of energy, health and accessibility. Buildings that don’t connect with the street come in all shapes and sizes, but they tend to have the same dismal effect. Much of my work is focused on motivating people to ask themselves: how does this place make me feel and why? The purpose of my question is to raise awareness for the impact of physical space on our state of mind. Most people tolerate places that are bad for their psyche without considering how it affects their mood, their physical health, and ultimately their neurological health. Conversely, they rarely consider the design elements that make them feel better. Neurotic behavior due to unnatural design is more obvious in zoos than in human habitats. Animals pace back and forth, pick fights and exhibit obsessive behaviors when they must cope with deprivation design. Diagnosis of human depravation design is more complicated. My recent quest has been to find simple “test” questions that anyone can use to analyze any human habitat. A flash of insight came to me while watching the Smithsonian Institution’s National Zoo Panda Cam, which generously gives the public a window into the world of giant panda mother Mei Xiang and her cub, Bei Bei. AHA! Now there’s a test question that cuts through all the fancy design terminology about qualities of streets, buildings, public spaces, and other locations where humans spend time. Which of these locations can be described as someone’s happy place? Every place cannot be a happy place. Some places need to provoke or protect us. A universal, constant state of happiness with no contrasting emotions would be boring. 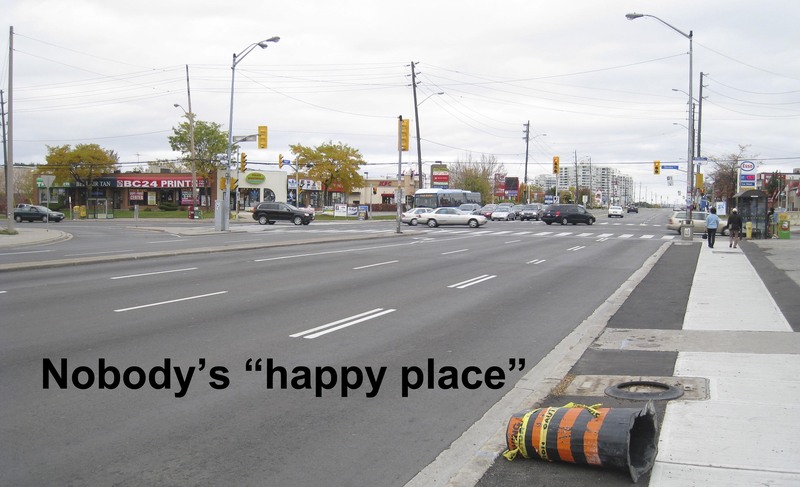 But we all need to ask whether we are spending enough time in “our happy place” from a design perspective. 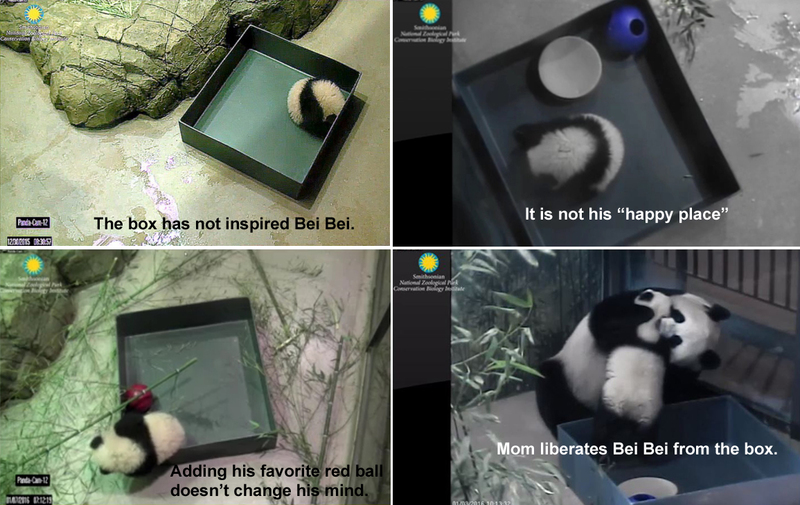 At nearly five months old, Bei Bei makes his public debut this month. 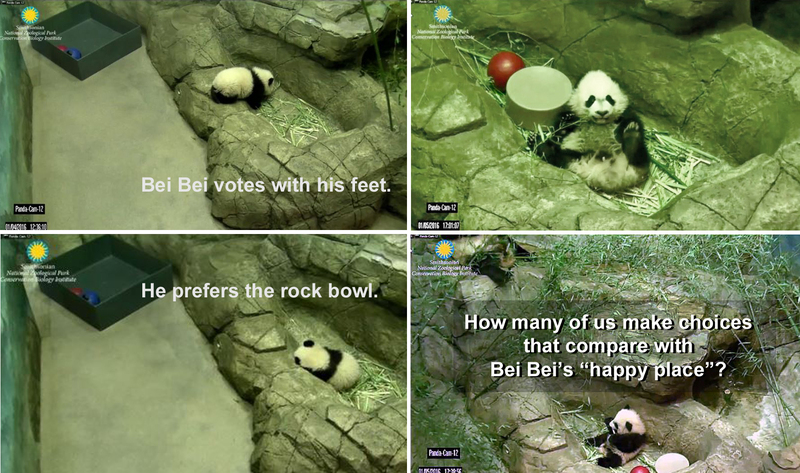 You can see him in person and observe his design preferences…because Bei Bei votes with his feet (see photos below). My video, “Diagnose Your Habitat” suggests five vital signs that contribute to healthy cities and workplaces, in case you want to see lots of examples of happy and unhappy places. The many rewards of pedestrian life include unexpected encounters – such as with the legendary white squirrel of Toronto’s Trinity Bellwoods Park. Not only does the white squirrel have a street and coffee shops named after it, but the critter has taken on symbolic qualities. Some folks believe they bring good luck. 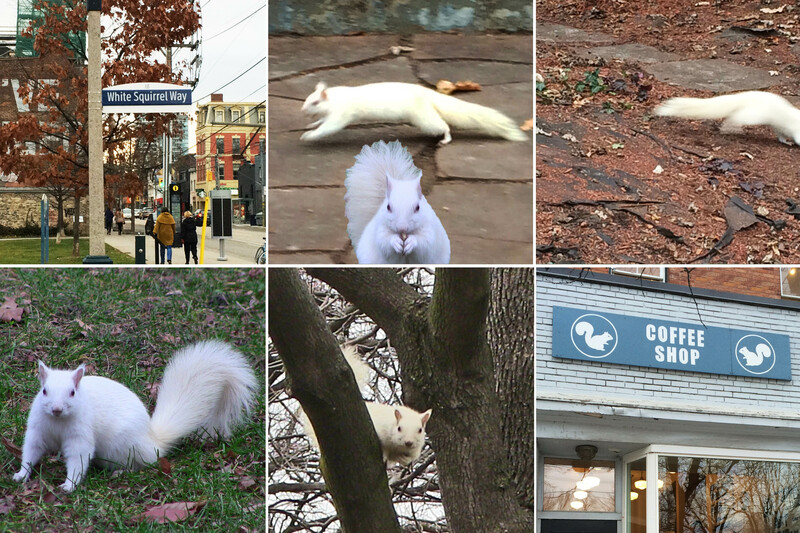 In any case, the white squirrel attracts celebrity-seeking paparazzi and adoring fans whose stories add to local history. A much publicized accidental electrocution in 2014 further elevated this mammal’s mystique when questions arose as to whether we’d ever see a white squirrel again. But last week one came out to pose for my photo essay on animals that animate our streets. Then, like the White Rabbit and Garbo, it vanished out of sight. 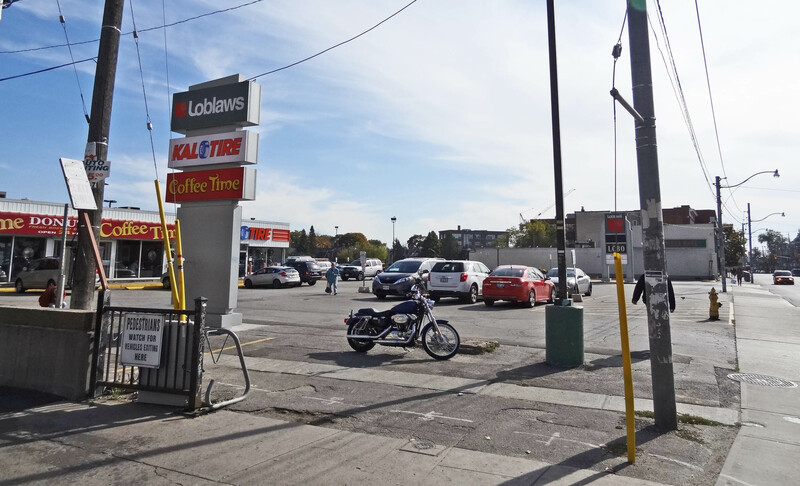 The pedestrian experience: Is your street antiseptic or animated? How does this street make you feel? What effect does it have on your mental health? 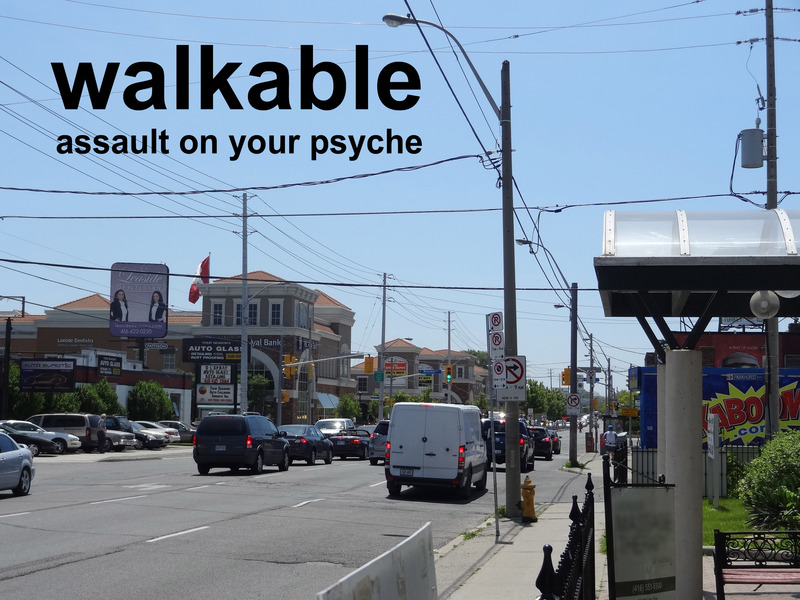 There is more to walkability than providing safe, accessible walkways and removing obstacles. 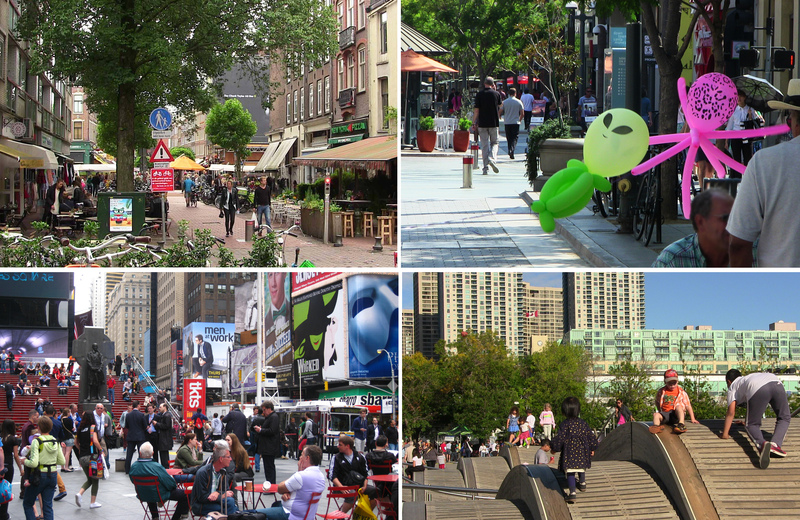 Walkability is also about visual qualities that feed our psyche by enriching our experience of every street. The slides below show thirty wide-ranging examples I’ve encountered during my recent travels. The lowly status of North American pedestrians has roots in the 18th century. Dismal walking conditions are enshrined in the dictionary definition of pedestrian: “dull, lacking in vitality and imagination.” Historically, pedestrians were too poor to ride a horse (equestrians). Then, during the 20th century, pedestrians were defined as people who had recently parked their cars. For more than six decades, the design of our built environment rarely considered the mental health of pedestrians. Buildings were designed to be driven past at the highest speed possible, to be seen from a mile away and/or to be situated close to giant parking lots. As the mental and physical health benefits of walking become more obvious, the desire will grow for places that are not just walk-able and safe but also walk-worthy. The question of how pedestrians feel is beginning to matter. In essence, streets must become more than “pedestrian” to better serve pedestrians. To accelerate the demand for walk-worthy streets and places, we must all become better critics. There can be no change without awareness, and no awareness unless we understand what we are looking at. How healthy is this place? How do I feel when I walk here? Clearly we need a better visual diet. Only recently has public demand for healthier food changed what people expect from suppliers and restaurants. Higher food quality standards are shaking up the marketplace. Pedestrians have a comparable unmet need to feed their heads with something other than asphalt. QUESTION marketing hype by asking, how does this place really make you feel? EXPERIENCE the feelings that various places evoke. Diagnose your habitat. 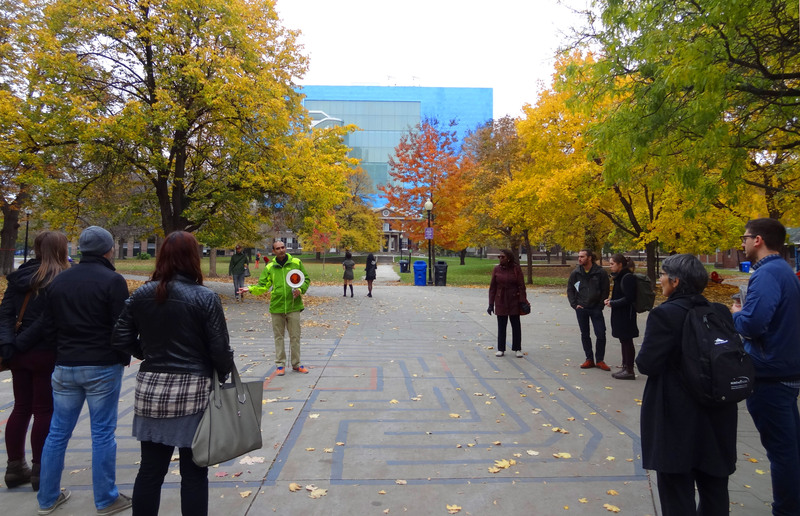 This weekend I participated in a Jane’s Walk led by HiMY SyED who has created over 100 labyrinths across Toronto using a tactical urbanist approach. Tactical urbanism is the act of making low-cost, often temporary changes to the built environment to improve public places, frequently without formal approval from authorities having jurisdiction. When these interventions are in place and demonstrate their value, they are likely to remain in some form. Unlike mazes which tend to be frustrating puzzles, labyrinths can clear your head and provide fresh perspective. Toronto may have more public labyrinths than any other city in the world. I also discovered this weekend that Toronto is where the world-famous Pumpkin Parade was launched at Soauren Park eleven years ago. This community participation activity has spawned 28 similar events in Toronto, as well as globally. It’s kind of a Boxing Day for pumpkins which occurs on Nov 1. Labyrinths and the Pumpkin Parade are two grass roots initiatives that add to the therapeutic benefits of urban parks. 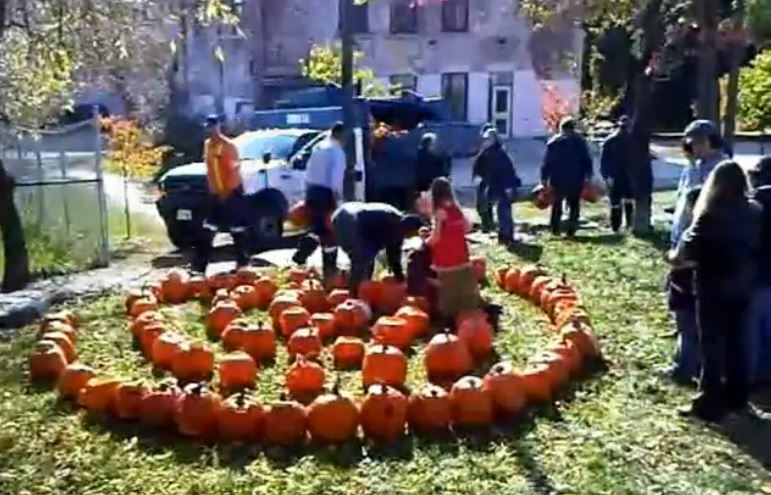 UPDATE from HiMY SyED – Toronto is also a pioneer in pumpkin labyrinths! Can anyone remember when the open road evoked images of unqualified optimism and possibility? Can we imagine how this might actually happen in the future? Not long ago, one word captured how people felt about the automobile: freedom. Back then, we could rely on expressways to escape stop-and-go traffic that might impinge on our freedom. We could even bypass a city altogether, which wouldn’t say much for the city. Now freeways have become places to get stuck, and their ecological toll has turned “freeway” into a anachronistic misnomer. There is nothing free about the freeways of Los Angeles. Last September I received the welcome news that two of my urbanist films would be screened at a festival in West Hollywood. But the thought of actually attending the festival didn’t appeal to me because I pictured myself either stuck in traffic or stuck without a car. And yet…my recent visits to the global mobility meccas of Amsterdam and Portland, OR made me wonder if I could learn something from the opposite extreme. Maybe I would find seeds – and even green shoots – of healthy city development in Los Angeles. Maybe (as I’ve seen in my hometown of Detroit) there are positive ways to take advantage of decades-long neglect by leapfrogging ahead of cities such as Toronto that must deal with the burden of aging infrastructure and the entrenched belief by governments that they can afford 20th century thinking. Indeed, as it turns out, Angelenos are beginning to appreciate the greater freedom and human contact made possible by alternative modes of transportation. Urban multi-modal mobility experts Chris and Melissa Bruntlett report in their post “6 surprising ways L.A. is looking beyond the automobile” on impressive initiatives toward “healthier, happier, simpler” ways of getting around town. 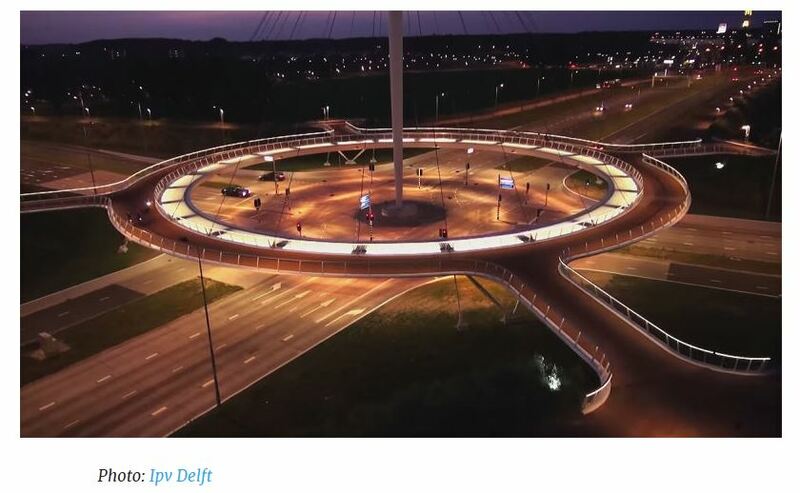 To do this will require a new concept of freeways. One big thing I noticed about Amsterdam and Portland was the overall lack of traffic, stalled or otherwise.